Stratford was founded in 1639 by Puritan leader Reverend Adam Blakeman (pronounced Blackman) and either 16 families—according to legend—or approximately 35 families—suggested by later research—who had recently arrived in Connecticut from England seeking religious freedom. Stratford is one of many towns in the northeastern US founded as part of the Great Migration in the 1630s when Puritan families fled an increasingly polarized England in the decade before the civil war between Charles I and Parliament (led by Oliver Cromwell). Some of the Stratford settlers were from families who had first moved from England to the Netherlands to seek religious freedom, like their predecessors on the Mayflower, and decided to come to the New World when their children began to adopt the Dutch culture and language. Like other Puritan or Pilgrim towns founded during this time, early Stratford was a place where church leadership and town leadership were both united under the pastor of the church, in this case Reverend Blakeman. The goal of these communities was to create perfect outposts of religious idealism where the wilderness would separate them from the interference of kings, parliaments, or any other secular authority. Blakeman ruled Stratford until his death in 1665, but as the second generation of Stratford grew up many of the children rejected what they perceived as the exceptional austerity of the town’s founders. This and later generations sought to change the religious dictums of their elders, and the utopian nature of Stratford and similar communities was gradually replaced with more standard colonial administration. By the late 1600s, the Connecticut government had assumed political control over Stratford. Many descendants of the original founding Puritan families remain in Stratford today after over 350 years; for centuries they often intermarried within the original small group of 17th century Pilgrim families. Stratford’s original name was Cupheag, but was later changed to honor Stratford upon Avon in England. Despite its Puritan origins, Stratford was the site of the first Anglican church in Connecticut, founded in 1707 and ministered by the Rev. Dr. Samuel Johnson. Settlers from Stratford went on to found other American cities and towns, including Newark, New Jersey, established in 1666 by members of the Stratford founding families who believed the town’s religious purity had been compromised by the changes after Blakeman’s death. Other towns such as Cambria, New York (now Lockport, New York) were founded or expanded around new churches by Stratford descendants taking part in the westward migration. U.S. President Gerald Ford was a descendant of one of the Stratford founding families, that led by William Judson. 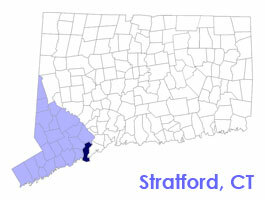 To share any Stratford, CT information with us, please contact us. Learn more about advertising in CTLiving.